If you haven’t heard, the weather in the Midwest has been quite a doozy this year! Earlier this week, the National Weather Service had predicted a lovely 4 to 8 inches of the nasty white stuff, but they said that if the storm shifted, we might just end up with rain/freezing rain/sleet and other lovely winter gifts. Apparently it shifted a bit because it rained most of the day yesterday. At about 4 or so in the afternoon, it started snowing. If we haven’t already had a couple feet of snow, I would have said that it was pretty snow, but not so much right now. Jason came home and we ate, and just as we were deciding what to watch on TV, the power flashed a few times and then went out. Guess mother nature decided that one for us! We just ended up going to bed early and honestly, I wasn’t that mad because I knew that I would be able to get up early and was planning on going to Mom’s for a sewing day. When I woke up though, I looked outside, and became quite mad. There were drifts in the driveway and I wasn’t quite sure that I would be able to get through them. Soon after, Jason’s aunt Julie called and told me that I probably shouldn’t go anywhere because on the “good side” of the gravel, there were 3 foot drifts, which was good compared to the 5 foot drifts on the other side of the road. So, it’s a stay at home day for me! Trying to make light of the unfortunate circumstances, I’ve decided to have a scrap making day! Mom and I are currently working on a top secret project (we’ll tell you as soon as we can) and these are some of the scraps that I have made. The project that I am working on now, has lots and lots of triangle leftovers that I’ll be making into a little bed for Puppycat…although I have been saying that for a few years now…Maybe it’ll happen one day! This entry was posted in Uncategorized on February 21, 2014 by Kelli. I do not envy you the snow, even though we could use more in the mountains. 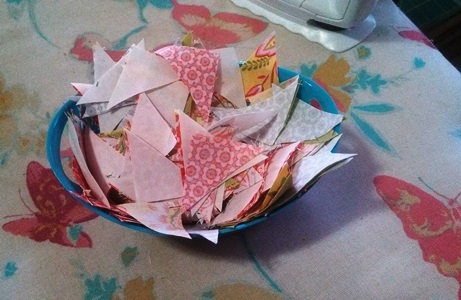 What a great time to have a “sew day”, even if it’s making scraps. Love the posts from you and your Mom. I certainly wish your snow would take a huge detour west – we could sure use it! Stay safe and warm…keep playing with fabric!!! Funny that you call it Scrap making. No more snow here, but windy weather that wakes me up at night. Olympics are cutting into my Sewing time. I did get two Bindings tacked down watching though. YEA!